When our customers succeed, we are doing our job well. And doing our job well comes with risk. the need to keep us with digital innovation and better ways of doing business that improve our customers experience. IBA knows we cannot eliminate all risks. To keep the risks we’ve identified managed at an acceptable level, we continue to take a professional approach to managing risk in relation to our financial affairs as well as compliance, governance, reputation and operational matters. Risk is not simply about our ability to manage it but also about educating our customers and making sure we are not setting them up to fail. Because IBA can take on higher risk opportunities or ideas, we review, test and confirm if our risk continues to provide benefits that our customers cannot receive from mainstream lenders or investors. However, we seek to lend and invest responsibly, with the benefit of prudent due diligence. 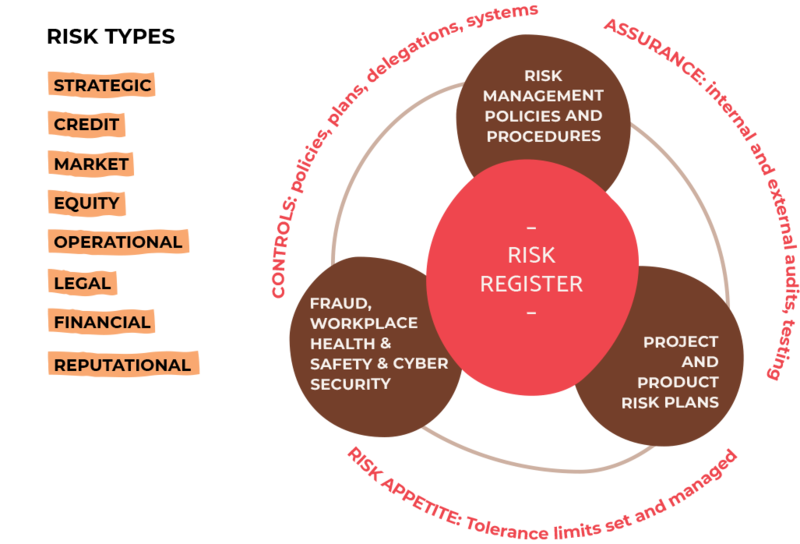 IBA’s Risk Management Framework is shown in the diagram below and highlights the processes of control that IBA has in place to manage risks that could occur in the next 12 months. We can’t always control the risks but we can manage how they affect us so that we continue to deliver to our customers.